We offer a variety of colorful and fashionable short and medium length earrings for you to choose from that can help update your wardrobe. These green and pink earrings are a must have if you are looking for something to spice up a few p.. These earrings have a blend of raspberry, light and dark pink smooth and faceted jade beads which ar.. Think of how these delicate lavender earrings can accent that special top or dress you have. T.. These earring could be just what you need to give your style an extra boost. They are made up .. These delicate pink and blue earrings are made up of rose quartz beads, Swarovski crystals and facet..
Bring your outfit to the next level with these faceted tiger eye earrings which are accented with ..
Give your top a touch of style with these pale gray blend earrings. They contain smooth c.. Highlight your look with these brown tiger eye earrings. They contain gold tone componen.. 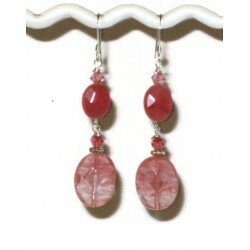 These delicate light coral earrings contain mother-of-pearl shell beads, faceted Czech glass a.. These delicate earrings contain freshwater pearls, Swarovski crystals and faceted cats eye beads.&nb.. These earrings consist of mother-of-pearl beads, freshwater pearls, Swarovski crystals and fac.. These earrings contain faceted glass two tone glass beads, mother-of-pearl, black onyx and Swarovs.. These earrings contain Swarovski crystals, faceted cats eye coins and tiger eye beads. Th.. These earrings contain mother-of-pearl beads, freshwater pearls, Swarovski crystals and faceted jade..